What a sad indictment of our current elite, that a book about how to leave the EU, first published in September 2017 – seemingly late, at 15 months after the referendum – has been released in a new edition already, amidst renewed “project fear” about how bad leaving would be. This new edition benefits from a new foreword by Gisela Stuart, a new preface and a new conclusion by the two authors, and a new afterword by Jacob Rees-Mogg. Their similar pithiness and erudition make their lancing of “project fear” an enjoyable, revelatory ride. Liam Halligan you’ll probably remember best as economics correspondent for Channel 4 News, before it turned in the 2000s to sensationalist socialist sophistry. I remember him on that programme complaining about the insufficiency of economic literacy in this country. How more important that seems now that the myths of “project fear” are dominant. Appropriately, the book criticizes “the group think and status quo bias of the economics profession” (page xv), “how quick much of the UK press corps was to accept briefings from the [President of the European Commission, Jean-Claude] Juncker camp as an accurate analysis” (page 104), and how, instead of analysing the opportunities after Brexit, “the media is fixated, instead, on how we will leave – and if we will leave” (page 305). Halligan’s co-author is Gerard Lyons, whom you might have seen commentating, but has stuck to a career in finance. This is not a short book, it’s not a superficial book, but it reads easily. The chapters on the EU’s prior history are the best summaries I’ve seen. The analyses of the current issues are accessible, yet contain enough depth for the academic and the diplomat. I kept wondering, “Why can’t our politicians and journalists communicate so clearly and accurately?” You probably know the answer to that: most are bluffers. I will criticize the authors for not updating their data in the main body text. In the first chapter, you’ll read economic forecasts for the final quarter of 2017 and first quarter of 2018. In the later chapters, you’ll read their forecasts for the European Union (Withdrawal) Bill in autumn 2017. These forecasts could have been replaced easily with what actually happened. However, the other parts remain current, because the government has achieved naff-all since the first edition. A clean Brexit means fully separating from the EU, just as Brexit was interpreted during the referendum. After separation we would be left with WTO (World Trade Organization) rules at bare minimum, which effectively guarantee equal trade except as agreed bilaterally or interrupted temporarily on grounds of security. Most of Britain’s trade is under WTO rules, including with the US, China, India, and Brazil; the EU too trades with most countries under WTO rules. The EU is incentivized to comply, given its trade surplus to Britain. Better than bare minimum would be a free trade agreement, but the authors consistently remind us that Britain cannot hope to negotiate a free trade agreement unless it stops pretending that WTO rules amount to a cliff edge. The authors note that the government sabotaged itself by not promoting the possibility of no deal as a “perfectly acceptable outcome” (page xiv). The government still contradicts itself: earlier this month, it released belated, sparse, alarmist advisories about no-deal, then (given the backlash) used the latest Brexit Secretary (Dominic Raab) to play down its own fear-mongering, only for him to be contradicted by the Chancellor (Philip Hammond), who claimed that no-deal will slow economic growth by up to 10 per cent over the next 15 years. Then Hammond was contradicted by the Prime Minister, who restated that no deal is better than a bad deal, although her intervention is difficult to believe given her normal panic. Instead, the government has wasted its time pretending that it must wait for the EU’s cooperation, or it can’t find enough civil servants, or it still needs to develop a policy, or (at Chequers in July) that Britain needs to stay in the common market and customs union for goods, which then scuppers any independent FTA. Reading this book further clarifies how pathetic the British government has become. This book is more than a blueprint for Brexit – it’s a wider manifesto. It notes the huge economic problems driven by the shortage of housing. Apart from controlling immigration, the book recommends that the government should set up its own National Development Corporation, which would purchase land, grant planning permission, then sell the land at a profit for private development, then use the profits to fund infrastructure (page 10). The author’s champion also the Labour Party’s policy to create a National Transformation Fund to invest £250 billion over 10 years in infrastructure. The authors state unambiguously: the “Labour manifesto was right” on this (page 12). Another recommendation in the same vein is to make broadband a utility. These policies prove the book’s a-partisan pragmatic approach. The authors are not socialists – they just recognise (as all politicians should) that sometimes situations arise where more state intervention is needed (which neo-conservatives never accept), sometimes less (which socialists never accept). At the other end of the political spectrum, the authors stand with conservatives for a reduction in regulations and taxes, particularly on small and medium enterprises, which struggle most to handle them. 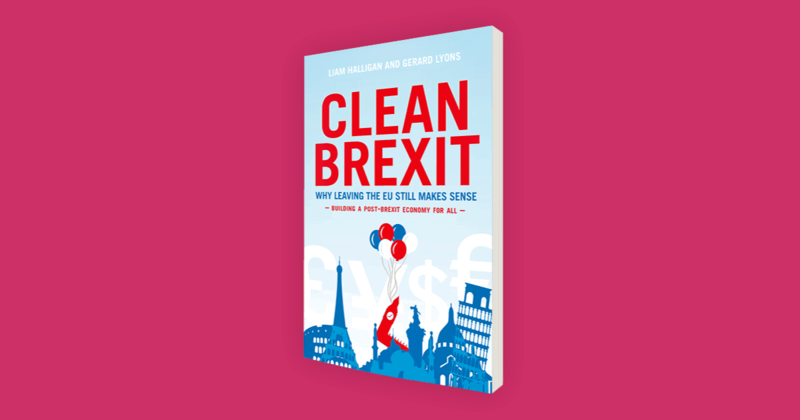 The book frequently points out the stranglehold that “big business” has on government, pretending that the EU is best for everybody, acting through civil servants who don’t have enough competence to think independently. The authors stand also for decentralization to local authorities of stamp duty from property transactions, which could go towards the local infrastructure supporting those properties. While we’re focused on freeing ourselves from the centralization and under-accountability of the EU, we’re under-estimating the centralization and under-accountability of the British government, but that focus will come. Halligan and Lyons partly address this future by urging the government to distribute to local governments some of the powers that will be returned from Brussels. Theresa May and her cronies could restore their credibility more by justifying their policies in comparison with this book than in comparison with any missive from Brussels.